This award recognizes an Ontario health-care organization for its work to foster involvement of RNs in their professional association. The winning organization creates a climate of professional partnership and quality work life, and is committed to promoting professional development and research-based practice. The Ontario Telemedicine Network (OTN) is a leader in implementation of RNAO best practice guidelines (BPG). Since achieving designation as Ontario’s first telemedicine Best Practice Spotlight Organization (BPSO) in April 2015, OTN has implemented nine BPGs across 12 sites. It has launched monthly virtual clinical rounds across all sites to provide a healthy and supportive work environment and to promote knowledge exchange regarding the implementation of BPGs. To cultivate leadership across 11 LHINs, OTN ensures the continued engagement of front-line staff in brainstorming, evidence sharing, and planning exercises. Its efforts to create professional partnerships are not only reflected in its BPG work. OTN was recognized last year by Ontario’s Ministry of Health for joining forces with the North East LHIN to create its visionary Virtual Critical Care Unit, which uses state-of-the-art videoconferencing technology and electronic medical records sharing to connect large critical care units with smaller ones across northern Ontario. The initiative won a Minister’s Medal Honouring Excellence in Health Quality and Safety. OTN consistently fosters involvement of its staff in RNAO by encouraging BPG champion certification and hosting onsite workshops to achieve the title. 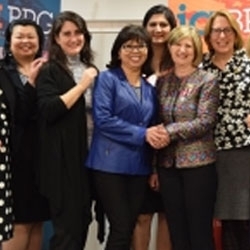 The organization’s participation is also a staple at RNAO events, including many of its healthy work environment and clinical BPG institutes.